How we move - trends, insights, marketing, strategy: How to market to stubborn rebels who will not be told what to do! How to market to stubborn rebels who will not be told what to do! I was working on an anti-smoking campaign a while ago and one thing was clear: smokers do NOT want to be told what to do or that anything bad will happen to them. Partly, it´s because a lot of smokers will have a rebel personality – which turns them into smokers in the first place – and partly, it´s because they love their smoking so much they don´t want to hear the truth about it, and be put in a state of guilt. They´d rather close ears and eyes and open their mouth for another ciggie as soon as an ad is on. How to get pass that?? Roger Dooley writes on his Neuromarketing blog about an interesting experiment, targeting people who believe they are invulnerable – standing over all risks, immune against threats. 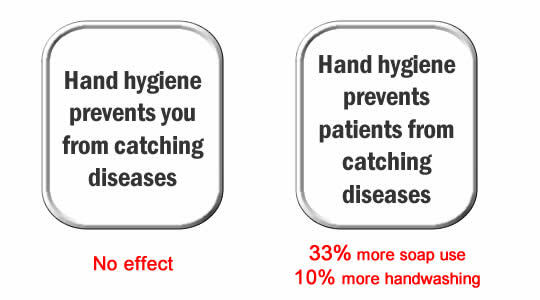 According to Penn psychologist Adam Grant, even among health care professionals hand-washing practices leave a lot to be desired, and a hospital wanted to change this situation. Grant conducted an experiment by placing a sign next to a hand hygiene area. 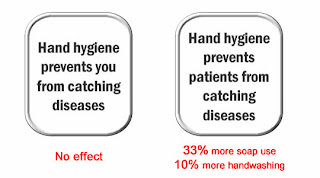 One version of the sign read, “Hand hygiene prevents you from catching diseases,” while another version said “Hand hygiene prevents patients from catching diseases.” And the results give us as marketing strategists a hint on how to best make these stubborn rebels to do what we want them to do. I believe this has nothing to do with altruism, but with the fact that these people simply don´t want to be told what to do. They can take information in, but not as a demand. When you say “This prevents YOU from disease” you sound paternalistic and bossy, and a lot of people hate that. When you on the other hand give them facts, you open up for them to draw the conclusion themselves. When it comes to smoking campaigns, I believe an effective way to reach into the smokers mind and get pass the defence system they have against authority is to give them facts and figures in a low key way rather than the full on way they are presented today, and to point out how their children are getting affected by the smoke in this very moment.